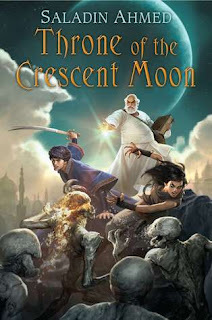 Throne of the Crescent Moon is an adventure with a heap of mystery in a rich, Arabian-inspired fantasy setting. That alone was enough to hook me. There's plenty of good things to say about this book -- clear prose, tight plotting, and an epic story tucked into a slim 274 pages. But I loved this book because of the characters. Specifically, the young helpers of our main character, a world-weary ghoul hunter named Adoulla. Raseed has been Adoulla's assistant for some time. He's a member of an order of holy warriors and, refreshingly, he's anything but a hypocrite. I cringed through this book as moral dilemmas presented themselves. Watching him struggle to hold to his piety while doubting himself endeared me greatly. I almost wanted him to take the low road that would make his life easier at the moment -- but if he did, he wouldn't be Raseed and I wouldn't adore him half so much. Zamia, a young woman who can take lion-shape, falls into Adoulla's group early in the book. Like Raseed, she puts duty before herself. In her case, this means avenging her band, who were all slaughtered by the monster Adoulla hunts. In the back of her mind, she knows her band isn't entirely dead; she's alive, after all. If she survives, she could have children and keep the band alive. Her eyes drift to Raseed (there's some drifting back) but refreshingly, she never pines or complains. She has her duty; everything else can wait. Self-doubting perfectionism and unflinching dedication to family? I'm sure it wasn't the author's intent, but this describes a lot of the moms I know. These characters resonated strongly with me. They hit a sweet spot. I loved it. Language: I don't recall any swear words, but there are plenty of highly creative insults not meant for little ears. Violence: Lots. The most graphic parts are contained in a handful of chapters from the villain's point of view, so for the squeamish, the bulk of it is easy to skim over. Sensuality: Everything in-scene is mild, but there are those creative curses and prostitutes do exist in the city. I love the title and the setting of this book. They both caught my interest.